that long winding road: Drat..
Where did I put my down socks ? Cold season in Ladakh comes in three different comfort zones : most rooms never get anywhere near warm in daytime , the south facing shelkhang room with large single pane glass windows quickly become about as cold as on the outside at night , but quickly heat up in the morning sun, and a few places , like the SECMOL campus , with solar heating it´s surreally warm long in to December : sleeping with a single blanket , and your hands on the outside. 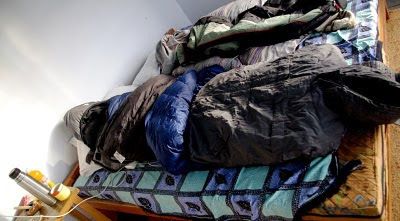 When you start to have to sleep with the laptop in the sleeping bag it´s time to shift from sleeping in the shelkhang.